Mr Obama told parliament in Ghana during a one-day stay that good governance was vital for development. The US president's trip came at the end of a summit of eight of the world's most powerful nations, held in Italy. Ghana was chosen as the destination for the president's visit because of its strong democratic record. After his speech, Mr Obama headed to Cape Coast Castle, a seaside fortress converted to the slave trade by the British in the 17th Century. He was accompanied by his wife, Michelle, a descendant of African slaves, and both of his young daughters. Speaking after a tour of the fort, Mr Obama said the fort should be a source of hope as well as repository of painful memories. "It reminds us that as bad as history can be, it's always possible to overcome," he said. Earlier in the day, Mr Obama spoke to members of parliament after a breakfast meeting with Ghanaian President John Atta Mills. He wore a broad grin as he was greeted at the podium by a series of rousing horn blasts from within the hall. "Congress needs one of them," Mr Obama joked, before turning to more serious matters. "I have come here to Ghana for a simple reason," the US president said: "The 21st Century will be shaped by what happens not just in Rome or Moscow or Washington, but by what happens in Ghana as well." 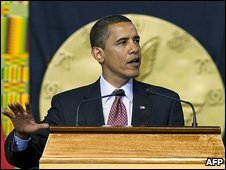 Delivering a message that "Africa's future is up to Africans", Mr Obama conceded that the legacy of colonialism had helped breed conflict on the continent. "But the West is not responsible for the destruction of the Zimbabwean economy over the last decade, or wars in which children are enlisted as combatants," he added. He praised Ghana's own progress, governance and economic growth, saying Ghana's achievements were less dramatic than the liberation struggles of the 20th Century but would ultimately be more significant. "Development depends upon good governance," Mr Obama told legislators. "That is the ingredient which has been missing in far too many places, for far too long. "And that is a responsibility that can only be met by Africans." He hailed Ghana's democratic society, calling for strong parliaments, honest police, independent judges and a free press across Africa. "Africa doesn't need strongmen, it needs strong institutions," Mr Obama told his audience. "No person wants to live in a society where the rule of law gives way to the rule of brutality and bribery. That is not democracy, that is tyranny." "Africa is not the crude caricature of a continent at war," Mr Obama added. "But for far too many Africans, conflict is a part of life, as constant as the sun. He described wars as a "millstone around Africa's neck". "You have the power to hold your leaders accountable, and to build institutions that serve the people," Mr Obama said, describing freedom as Africa's "inheritance" and urging the continent to beat disease, end conflict and bring long-lasting change. In an echo of his presidential election campaign, he drew his speech to a close with a version of his trademark slogan: "Yes you can," he told the gathered legislators. Speaking to the BBC, Kenyan Prime Minister Raila Odinga welcomed the speech. "We should stop blaming colonialism for our under-development. We really need to address issues of governance, because I believe it is the mediocrity with which Africa has been governed that is responsible for our backwardness today." Mr Obama arrived in the capital late on Friday, fresh from the G8 summit in Italy where heads of state agreed on a $20bn (£12.3bn) fund to bolster agriculture - the main source of income for many sub-Saharan Africans. He left after dark on Saturday, offering a final thanks for his welcome. "As somebody whose father comes from Africa I am pleased this visit has been particularly meaningful for me," Mr Obama said. 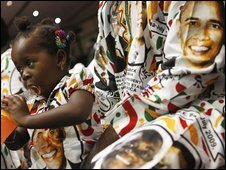 African view: Shipshape for Obama?